2. Place the cod loins in a small roasting tin. 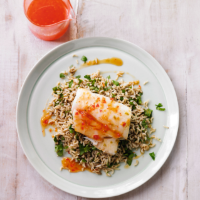 Mix together the chilli and the soy sauces, and the zest and juice of the lime, then drizzle 2 tbsp over the fish. Bake the cod for 15-20 minutes until just cooked through. 3. Meanwhile, cook the rice according to the pack instructions, mix with the coriander and top with the cod. Drizzle over the rest of the chilli dressing and serve.